We see if the force is strong with DICE’s update of the beloved series. I’ve thus far resisted getting on the hype train for Star Wars Battlefront. I can’t say I was ever that huge a fan of developer Pandemic’s original Battlefront games, and I’ve been burned before by “multiplayer first” titles (Evolve, anyone?) Needless to say, EA and developer DICE have more than a bit to prove with their initial foray into Star Wars. They certainly are putting a lot of faith into it, with ads for it plastered all over E3, three separate booths for it and their logo put right below the title in big letters. The demos I sampled were centered around three things: 20 v. 20 multiplayer battles, smaller, more deathmatch-style matches and the game’s co-op mode. No matter what demo was in front of me, the game looked great, with vibrant colors and particle effects creating great smoke effects and poppy laser shots. The audio design was standout as well, as everything from the sound of an Imperial Walker to the iconic sound of a laser ripped straight from the movies. The gameplay itself was a fairly standard shooter experience, with two weapons and regenerating health. 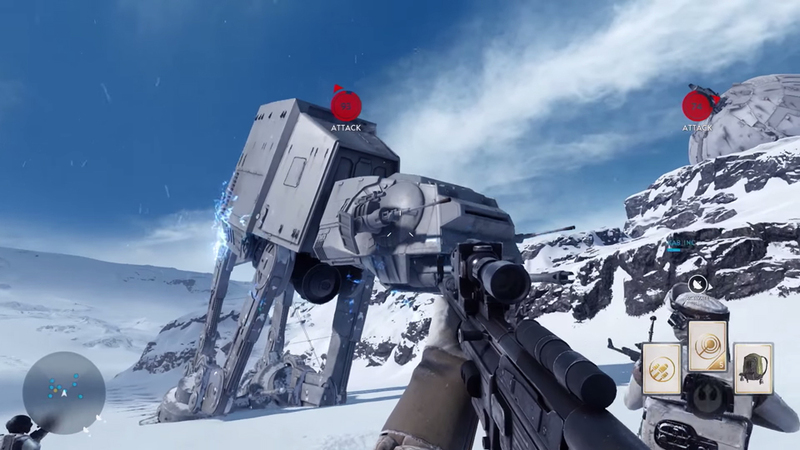 Although, Battlefront luckily also has the option to play in both first and third person. There was also a few extra goodies that made play more frantic, like a jetpack for hopping over gaps and a portable shield. Of all the modes on display, the 20 v. 20 battles were a standout. Running through the trenches of Hoth blasting away Stormtroopers (or Rebels) was loads of fun, and actually had a bit of a World War I vibe to it. Coordinating with your team to capture strategic points and take down big mechs like AT-ATs was great too, and it was hard not to find flying above everyone in an X-Wing particularly joyful. Although, it was hard to get airborne, as vehicles are treated more like power-ups and can be hard to find. The smaller battle and co-op modes weren’t anything too exciting, with the smaller scale battle offering the usual team deathmatch kind of action DICE is known for. Co-op was a bit more interesting, with Admiral Ackbar giving you and your partner missions like defeating waves of enemies or protecting strategic points. It doesn’t give the frantic feeling of being in an actual battle like 20 v. 20 does, but still offers some fast-paced fun with a friend. I was slightly disappointed that there wasn’t more to this mode, though, as split-screen co-op is about the closest Battlefront gets to any kind of story mode or single player content. Overall, I enjoyed Battlefront far more than I thought I would. The game is still sparse on content, with just multiplayer on tap for now, so people looking for a more robust experience will probably have to keep looking. However, the content it has is pretty good. The frantic 20 v. 20 battles really make you feel like a part of Star Wars, and offer just enough variety to keep things fresh. While it’s a little hard to shake the feeling that Battlefront is merely a tweaked version of DICE’s other big series, Battlefield, the inherent fun of the game and the care that’s been put into making it feel like Star Wars make it hard to complain. Do you think ‘Battlefront’ offers enough to justify the price tag? Tweet me @MaxMielecki. And be sure to follow us @YouNerded.